Third and fourth week of search and travel. It was hard, coming back from the jungle. We drove that day, Monday the 30th of April, from 600 meters altitude to 3 km high. The landscape changed dramatically, as did the weather. It became cold and cloudy. The mountains and volcanoes around our destination didn’t interest me. But once again we had to conclude that the area’s in between the dramatic changes, were most beautiful. That meant; the going up (or down) between the Andes and the Amazone. We reached Cotacachi without having succesfully arranged a place to sleep. 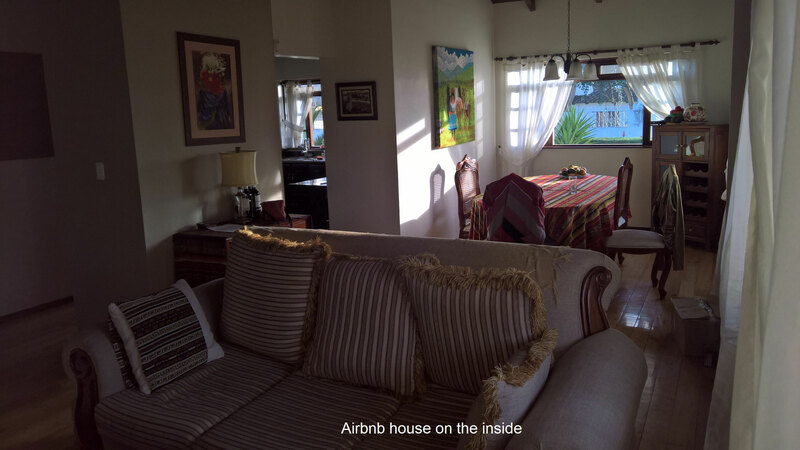 That morning, driving out of the jungle and into reception for our phone, the message appeared that the Airbnb we had arranged, had been cancelled. We found a hotel that seemed ok. But as usual, looks isn’t everything. The mattresses were so thin, we were actually sleeping on wood. The next morning we didn’t know how fast to get away from there. At least there was wifi, so we had the chance to find an Airbnb that was available and seemed good. When we arrived there in the afternoon, it WAS good. So good, we extended our stay. Instead of one week, we planned to stay half a week longer. The strange thing was; we did not feel any drive to go anywhere. So, next to viewing a lake that day, we didn’t really go anywhere for a while. Nothing could impress me after the jungle, it seemed. And for some reason we were very tired and needed the rest. 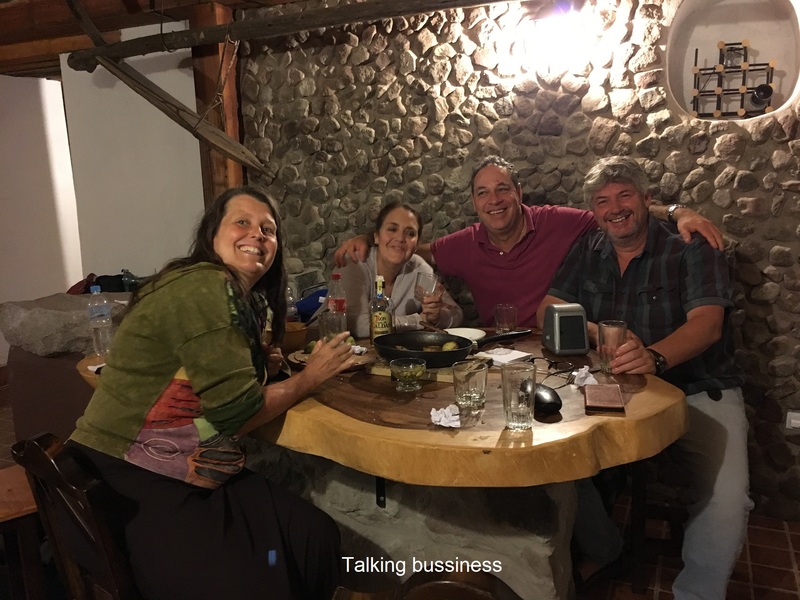 The only real action we took in these weeks, was; planning a get-together with our Ecuadorian friends from Quito, to talk about our business ideas. 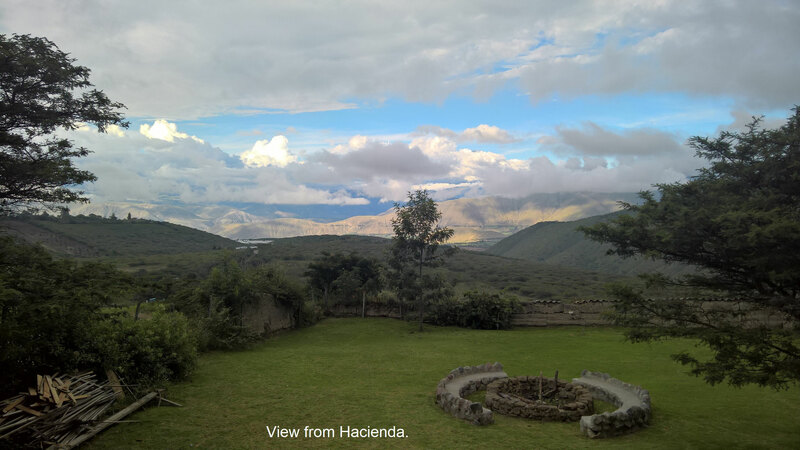 They invited us to their Hacienda in the weekend, in the neighbourhood of Cotacachi. A beautiful, 150 years old set of buildings stood there, on the top of a mountain. It almost looked like a small town. Most of it in ruins, but some buildings were beautifully restored. All of this overlooking the lands around. The day before, Eric and I spent all day preparing for this talk. Putting everything on paper, to get some order in our heads. 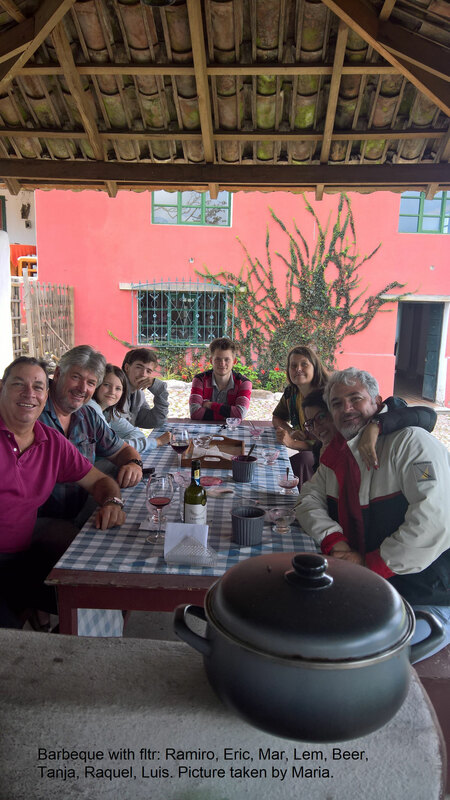 We enjoyed a barbeque together with Maria and Ramiro and Ramiro’s brother Luis and his wife Raquel. It was a mix of Spanish and English, trying to have a conversation. Especially the kids couldn’t follow the talking. Luis said that if he would take the kids with him for 15 days, they would speak perfect Spanish after. It was a tempting offer, although the kids did not agree. 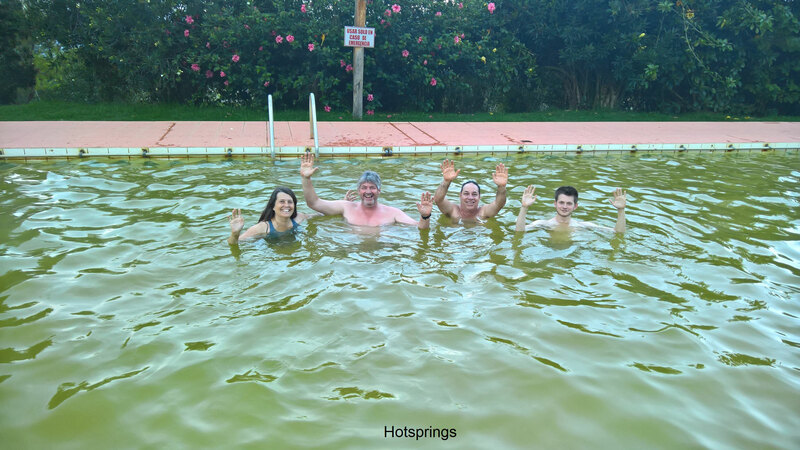 After the barbeque we went to the local hot springs- just with Ramiro and Maria- which was very relaxing. The barbeque and warm water were a good preparation for talking about the business proposal. Ramiro added some rum-cola to the mix after we got back at the Hacienda. And within a few hours it was all sorted. 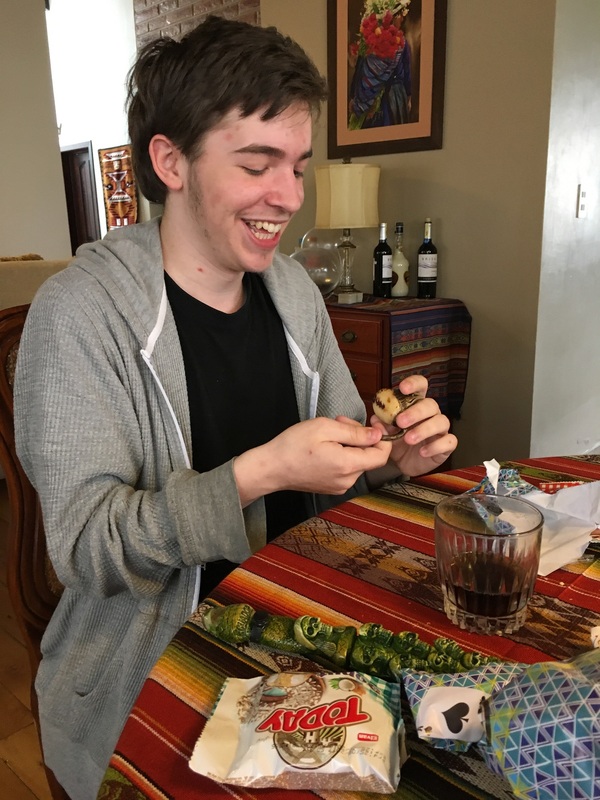 We had a good sleep-over at the Hacienda and in the morning we all parted with the notion that we had planned a timeline of some sorts and would talk over skype again on the 14th of May. The next event was on Monday; a visit to the Otavalo market, the biggest market in Ecuador. Lem did not join us, because our visit specifically had to do with buying gifts for his birthday on the 8th. Also; Lem always rather stays at home. The Otavalo market is a big marketplace with lots of stands and people that call you ‘friend’ and try to lure you to their goods, as in any country. There were a lot of Alpaca woollen blankets and clothes for sale and some really nice gadgets for Lem’s birthday. 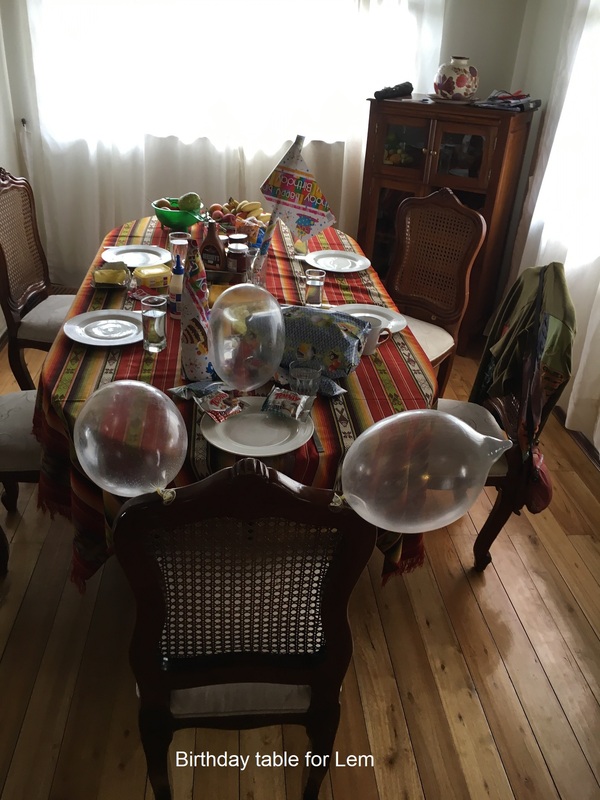 On his birthday we made the breakfast table look cheerful with presents, food, but also with some balloons. These balloons were actually condoms that Lem bought for Beer’s birthday for fun. We thought they had a good use in this case. Some of them had tastes and smelled like a candy store, so it was definitely cheerful. 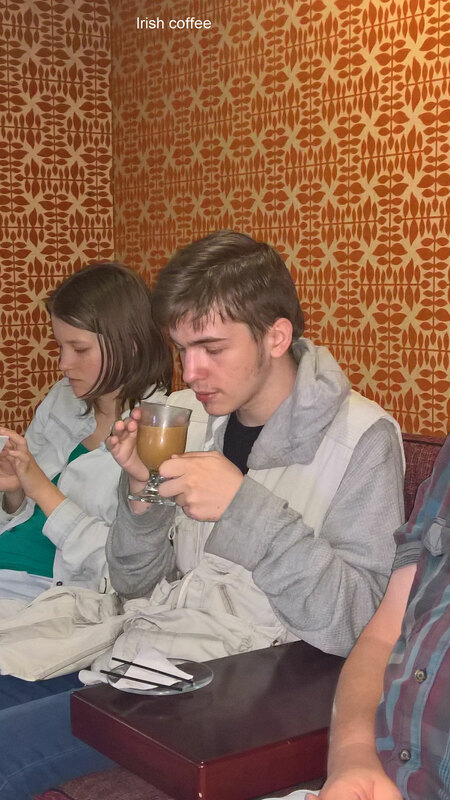 After the unpacking of the prezzies, we went to a café to get an Irish coffee, which had been one of his birthday wishes. We passed a tattoo shop on the way to the Irish coffee and Lem wondered whether or not this day was a good day for a tattoo. He eventually decided against it; he didn’t have any inspiration about what it should be and where it should be placed. Also; he hasn’t stopped growing, so on some areas of his body a tattoo might still stretch. To find out where to get good Irish coffee, I had joined the ‘Cotacachi expats’ group on facebook. I had also found out, through there, were to find a guy who made German bread and when and where a small market took place, where they sold European cheeses. 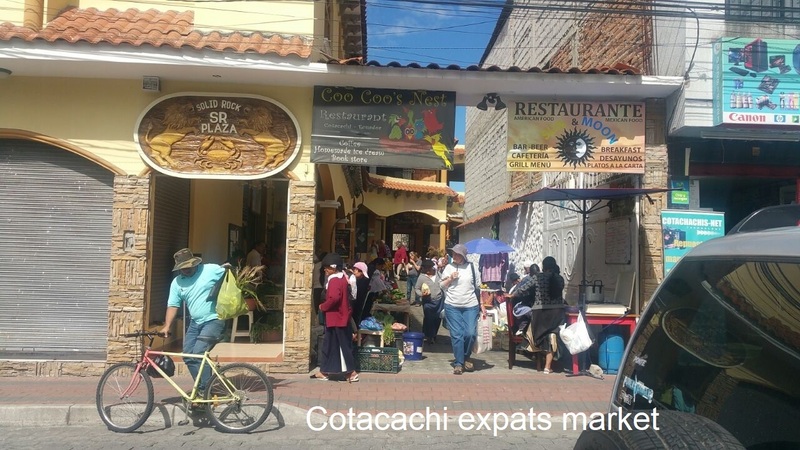 Cotacachi felt a lot like Vilcabamba, with its gathering of expats at certain places, the good coffee and European style breads and cheeses and its organic shop. 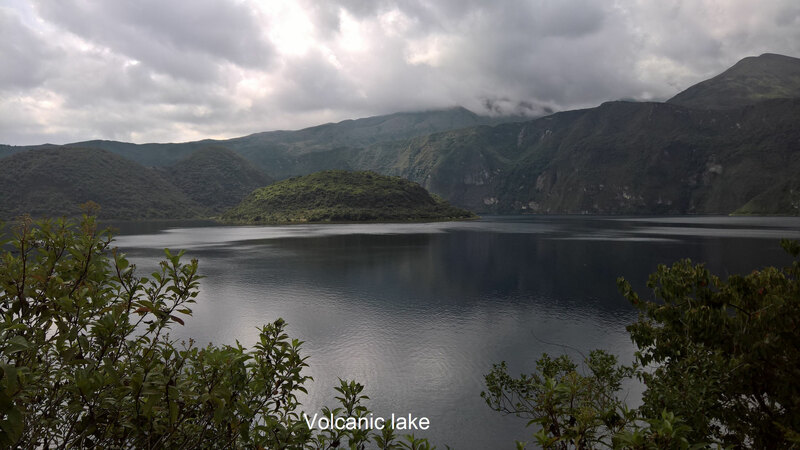 The difference was more in its climate (higher in the Andes, so colder), its surroundings (volcanic area) and the fact it is bigger than Vilca. 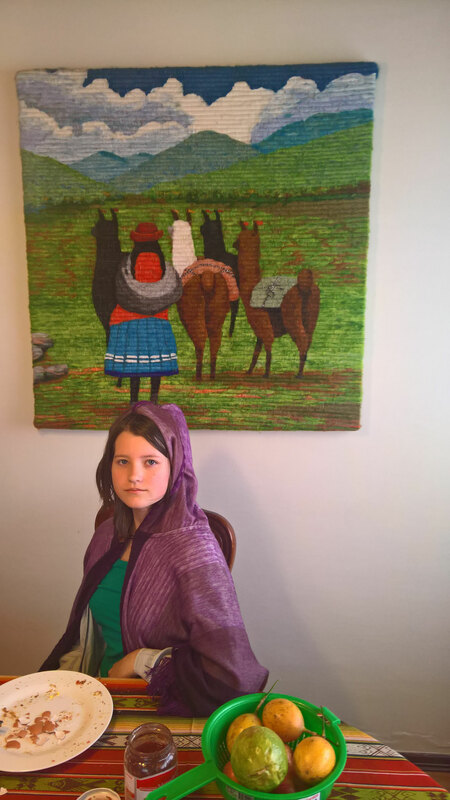 We were not looking for another Vilcabamba, but it also felt very ‘cozy’ and familiar to be in Cotacachi. And somehow we needed that for a little while. The house we were in gave us the same feeling as the town. We enjoyed having little to do but read, play games, work on the business ideas and watch movies with our beamer -that we brought on the trip- on the big white wall of the living room. We had started on the Harry Potter movies again, so we continued this trend. Life was comfy and we tended to let ourselves sink in it. When we left the house on Friday the 11th, to go to the coast, we knew it was good for us to move around again and be somewhat less comfortable. But we did resent leaving this house. During the barbeque at Maria and Ramiro’s place, Luis had offered us a free stay at his Hosteria at the coast. It was in the far North, below San Lorenzo but above Esmeraldas. It is considered ‘the danger zone’. Lots of police and military check points because the Farc is very active in this area. The area, so close to Colombia, is actively discouraged to tourists. Luis –however- says that his place is not in a tourist zone and there has never been any trouble with the Farc there. So hopefully we’ll be ok.
His Hosteria greatly suffers from this bad reputation and so does the whole area. Hardly any tourists dare venture here. He also said the beach was very unspoiled and beautiful. So he won us over and we made an appointment to meet on Friday, so he could show us the way. 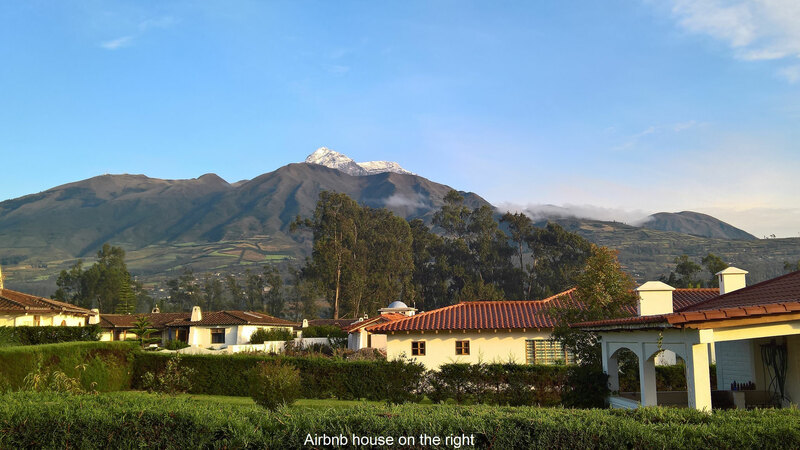 We decided against the area around Cotacachi and Ibarra, as a place to settle. Natuurlijk voor Lem een felicitatie. Wat een happening en echte condoomballonnen! Wauw. Ik lees vol plezier mee op en in jullie avonturen.